Latest notification of 27 FAD Recruitment 2017-2018 can be checked here. To select 291 candidates for the Tradesman Mate, LDC, Other Group C Posts this employment news is updated. Check full details in this post. Download the application form from 22nd Dec 2017 to 12th Jan 2018 (tentatively) @www.indianarmy.nic.in or www.ncs.gov.in. 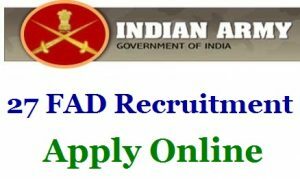 27 FAD Recruitment 2017-18 Notification: Are you excited to join in the Defence sector jobs? Are you looking for those jobs notifications? Then absolutely this was the best employment notification for the candidates who want the immediate recruitment notification of Defence jobs. Here we are going to express the information of the latest Defense jobs recruitment that is 27 FAD Recruitment of 291 jobs. It is the fact that 27 FAD will soon fix the date of the exam for the individuals who committed for this recruitment through the offline mode of application. So no candidate will be discouraged if they have the eligible educational qualifications as per the designation wise in this 27 FAD recruitment. It strictly it implements the rules to recruit the candidates in accordance with the educational qualifications. Download 27 FAD Tradesman Mate Application Form: 27 FAD, C/O 56 APO is one of the Field Ammunition Depots of the Indian Army. It works under the Ministry of Defence So it is a very responsible job. If you must be very careful while working in these type of organizations. All the job description is updated. Even after understanding all the essentials of this recruitment, if you are satisfied with it, then download the application form. The format or sample of the 27 FAD application form is ready at one of the below-mentioned sites. So you go to that site and take the xerox copy to fill up the details in the blanks of application. By using Recruitmentindia.in site, you can download the registration form. The complete qualifications for 27 FAD Recruitment 2017-18 notification as per the job wise. Candidate must complete Matriculation (10th Class Pass) from any recognized Board or Equivalent. Also should have ITI in Instruments Mechanic, Electrician, and Computer Hardware & Networking course approved as such by the Central/State Governments NCVT/Vocational Trg Inst or approved Defence services tradesman courses. Candidates, age must be as per the 27 FAD Recruitment that is maximum age is 27 years. Selected candidates for these posts will get the pay scale as per the salary norms of 27 FAD. Post the application form 27 Field Ammunition Depot, c/o 56 APO within 21 days, from date of publication of the advertisement in the Employment News. To give the Defence job employment to the 291 candidates, Indian Army has implemented this latest 27 FAD, C/O 56 APO Jobs Recruitment on the Indian Army job employment portal. From the portal only it will give the army Job notifications the public. To acquire army job updates made our page as the bookmark to visit directly without any delay. This 27 Field Ammunition Depot recruitment gives special relaxation for the reserved candidates in the options of age and application fees. But no reservation is permissible for the educational qualifications. The post names which are given in the present 27 FAD Recruitment advertisement is Tradesman Mate, Lower Division Clerk (LDC), Material Assistant, Fireman, Multi Tasking Staff (MTS). This department offers a good salary package for all posts. People with compulsory mentioned educational qualifications can give the application form before completing 21 days from the date of employment notification publication. Only The candidates belonging to Assam, Meghalaya, Arunachal Pradesh, Mizoram, Sikkim, Ladakh, Sub Division of Jammu and Kashmir state, Lahaul & Spiti District of Pangi Sub Division of Chamba district of Himachal Pradesh, Andaman & Nicobar islands & Lakshadeep will have to submit the application before completing 28 days from the date of employment notification publication. Abe kisse baat kr rhe ho sir sir bol kr..Computer se baat kr rhe ho kya? sir iska exam ho gya kya sir mane bhi fill kiya tha form but admit card he nhi aaya. sir plz btao exam ho gya iska.